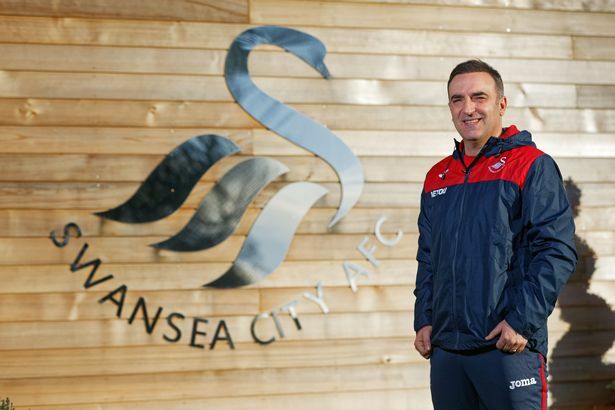 It doesn’t seem that long ago that the Swans, under then manager Paul Clement, managed to safely navigate the Premier League trapdoor with an impressive haul of 29 points in the 2nd half of the season. Who thought then that just over 12 months on, the Jack Army would be once again staring at an even more precarious position at the start of 2018. The received wisdom in the Premier League is fairly simple when it comes to the team at the bottom of the league at the turn of the year. You’re going down, unless you’re Leicester City, in which case you’ll pull off an escape that ends up looking easy and then go on to win the league by ten points the following season. Swansea are not Leicester City, so it’s beginning to look pretty dicey at the Liberty. Then again, this season the Premier League is split into three unequal parts. There is the Top Six, Mid-Table (which is basically just Leicester and Burnley), and everyone else is just hoping not to get sucked into an end-of-season relegation battle. Points-wise, the Jacks aren’t that far from safety, only 4 in fact. The bottom twelve teams of the division are not separated by much in the way of points, so is it too much to hope that a great escape could still be on the cards? For a while Swansea were the closest thing the Premier League had to a “Moneyball” side – young players, an effective tactical setup and a profitable transfer policy. Somewhere along the way the new board seems to have forgotten that for transfer profits to keep a club going, some of those profits need to be invested on the playing side. Last summer, Swansea sold Gylfi Sigurdsson, Jack Cork, and Fernando Llorente for close to £60million all in. That money has not been reinvested. If Swansea exit this window with the squad that entered it – or worse, lose Alfie Mawson and fail to replace him too – then they’re heading down. They need an injection of ingenuity to replace Sigurdsson more than anything, but a consistent goalscorer would help too. 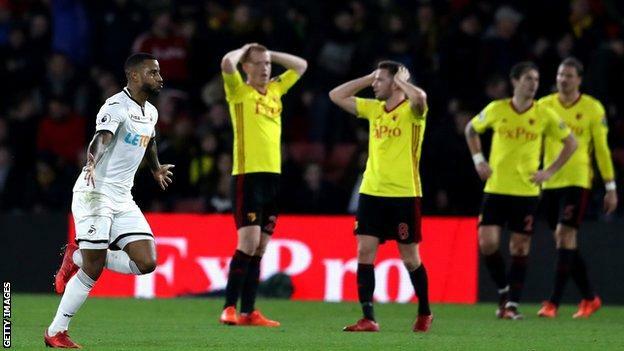 On the 30th of December, Swansea travelled to Watford and a familiar pattern established itself on the pitch – skilful, pretty football from the Swans was punctured by a goal conceded and a loss of confidence. From that point, the outcome looked likely to be the familiar defeat. However, clever use of the bench from Carlos Carvalhal saw Swansea punish a Watford side not riding high on confidence themselves, scoring twice in the closing minutes through Jordan Ayew and Luciano Narsingh to win only their fourth game all season. Showing that level of persistence will be essential if Swansea are to find a way to avoid the drop. The recent trip to Newcastle was a sign that there is enough skill in this Swansea side to win crucial games – they took the game to the hosts, who were favoured by Stratabet to win easily, and were denied a win by rank bad luck. Denied an obvious penalty when Mo Diame handled Mike van der Hoorn’s goal-bound shot, Carvalhal’s men could have been playing against ten men with a goal’s lead. A heroic goal-line clearance from the Magpies’ DeAndre Yedlin made matters worse as Wilfried Bony looked set to secure three points in time added on with the game at 1-1. This is the kind of frustration that burns all the worse for a team in Swansea’s position, and although boosted by the 2-1 FA Cup replay win in midweek over Wolves, with upcoming games against Liverpool, Arsenal and Leicester to come, Swansea will need their luck to even out real soon. There’s no doubt it will be a tall order – but stranger things have happened, and in the season where Chelsea are chasing Andy Carroll, they’re still happening.